Buoyed by crowd-pleasing tunes, eye popping choreography and charming performances, Classical Academy brought Lawrence Kasha and David Landay's classic story to new life at Escondido Center for the arts. Set in early America's frontier times, mountain man Adam Pontipee ventures into town with one thing on his mind, finding a wife. Enter Milly the innkeeper who after a lengthy courtship (of about five minutes) decides she needs a change in life and agrees to marry Adam and move away to the mountain. Little does she know that Adam has "forgot" to inform Milly that he also lives with his six brawling, uncouth and unkempt brothers. Aghast at their lack of manners, Milly sets her sights on transforming the brothers into proper gentlemen. The brothers decide that they too should seek brides of their own, and head into town. They find the six potential brides at a barn raising dance, but all are "spoke'n" for by boys in the town. Asking Adam's advice, he tells the brothers about a book he read about the abduction of the Sabine women (he calls the "Sobbin' Women") and the best way to keep them would be to trap the Brides (which they do) and take them back to the mountain. What follows is a delightful if politically incorrect musical. Olivia Pence (Milly) and Josh Darisay (Adam) were perfectly cast in their "tough on the outside" characters, and showed beautiful, well-trained voices in all of their musical numbers and were very well paired in "Love Never Goes Away" and "Wonderful Day". The Brothers, Roy Bennett (Benjamin), James Nichols (Caleb), Max Burns (Daniel), Noah Castillero (Ephraim), Alex Hale (Frank), Jonathan Norwood (Gideon), all wowed the audience with what seemed like a never-ending display of well-choreographed fight and dance scenes throughout the show, along with strong voices in �Goin� Courtin�� and �We Gotta Make it Through the Winter�. The "potential" brides, Alexi Ohre (Alice), Emma Tarr (Dorcas), Grace Taylor (Ruth), Jenna Kuebler (Liza), Sarah DeMarco (Martha), and Madison Lindsley (Sarah), delighted with fine comedic talent, sharp dance, and nicely distinctive portrayal of individual personality in each of their roles. Pulling it all together was an unusually tight and well-rehearsed (yet obviously having fun) ensemble of Townsfolk and Dancing Flowers, clearly focused by Jennifer McCormick�s direction. 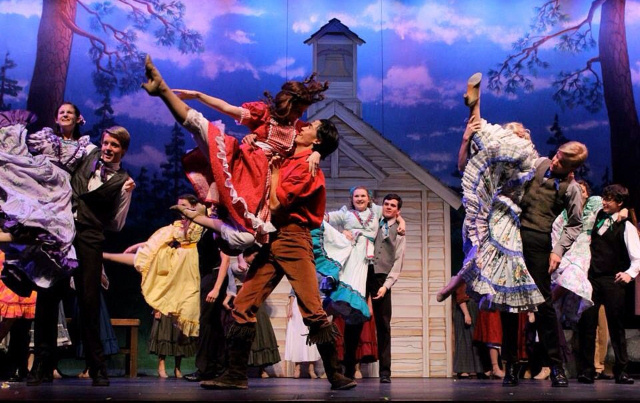 Beautiful set/drops, spot on period costumes, Broadway-quality direction and choreography, a refreshing six-piece band along with a multi-talented cast all came together to make �7 Brides� a huge crowd pleaser.